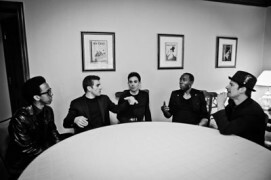 The Doo Wop Project stars leading cast members from the Tony Award Winning Broadway smash, JERSEY BOYS. The Doo Wop Project is a night of songs mixed with individual stories and references to their upbringings and experiences in the business, particularly backstage at The August Wilson Theatre, home of Jersey Boys, where the idea for the group was conceived. NOT a show featuring Jersey Boys material and/or songs by Frankie Valli and/or The 4 Seasons, this evening is an homage to classic Doo Wop and the music that was inspired by that sound, honoring songs and groups we hear all the time but maybe more importantly, some that exist only as a memory or somehow got lost along the way or are now relegated to box sets sold on late-night infomercials. Classic hits by every standard for every generation.